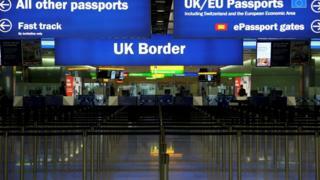 Could EU citizens get better UK access? It has been said of the Prime Minister that it is as important to listen to what she doesn't say as to what she does. When I interviewed her yesterday, I asked about an issue that is a live debate in government. Yes, the Prime Minister has been very clear about what the UK doesn't want in its negotiations with the European Union. No free movement of people. And no oversight of British laws by the European Court of Justice. But what about what it may offer to gain privileged access to the economically important single market? One issue where there appears to be some flexibility is the rules that will be put in place to control immigration into the UK. I asked Mrs May whether the government would consider allowing easier access for EU immigrants than those from outside the union. And in return gain better access to the single market than offered to non EU states. "When people voted on the June 23, they did vote for us to take control of our immigration laws for people coming from the EU into the UK," she answered. "They want the British government to be the government that is making those decisions on their behalf, and that is what we will do. "At the moment the Home Office is looking at the various systems we could put in place, the various rules that we could put in place and in due course we will be deciding which route to go down." So, it could be on the table, I asked. "We are looking at the various systems that are possible at the moment. The key issue for people here in the UK is that we have control - that it is the British government that is deciding our immigration rules." Which, of course, is not a no. This morning the chancellor said that the issue of preferential access "could be a subject for negotiation". He made it clear at the World Economic Forum that the government wanted to control the UK's borders, not close them. The debate, though live, is not yet settled. Another senior government figure I spoke to pointed out that a level playing field for immigration for all nations around the world could be an important part of "the offer" to countries outside the EU when it comes to negotiating free trade deals. I am told that Mrs May has not yet come to the point where the options are being "actively considered" by Number 10. The government is still in "looking at the alternatives" mode. But, given that the PM did not rule it out, what she didn't say may speak volumes.